Jon Robertson is a talented young footballer who is going places. The 22-year old was freed by Hearts as a teenager but the midfield playmaker has proved his doubters wrong with a string of fine performances for the Blue Brazil since bursting into the 1st team in 2008. “Robbo” recently made his 100th appearance for the Blue Brazil (2-0 win against Stirling Albion) but it took a character defining moment in Jimmy Nicholl’s office to mature from a promising youngster to club captain and one of the hottest prospects in the Scottish Football League. He now has his eyes firmly set on the league title and realising his future ambition to move back to full-time football. “It was great to make my 100th appearance although it was slightly overshadowed by a certain Mr Cowden making his 400th on the same day!” said Robertson. "Toorie [Craig Winter] is rightly a club legend and it is a privilege to have even played a quarter of his total for the club. The club currently sit proudly at the summit of the Irn-Bru 2nd Division and the player is very much focussed on a 3rd promotion in four years and a quick fire return to the 1st Division - preferably this time as champions though. “Our aim this season is very much to win the league. I think some people, in and out with the club, thought this was over ambitious but we very much have belief in the team. We have now played everyone and are the team to beat. There is a long way to go but we have set the standard that we need to maintain. “We are unbeaten at Central Park this season but funnily enough our best performances have come away from home on the big pitches at Airdrie (Marc McKenzie is still apologising for not setting up Scotty for a stick on hat-trick! ), Dumbarton and East Fife. The ambition for the league championship is very much fired by a lasting disappointment of missing out in previous seasons. “I feel we should have won the league in 2008/09 and 2009/10. It was a great achievement on both occasions to gain promotion but I felt a negative mindset crept in both times late in the season and cost us the title. “We had a fantastic team, particularly in 2009/10 with Gareth Wardlaw and Toorie immense signings and players like big Daz [Darren McGregor] playing out of their skins. Despite being everyone’s tips to be the whipping boys we came so close to winning the league that year. “The games that really stick out in my mind that cost us were the back-to-back 3-3 draws against Brechin City and Stirling Albion. We battered both teams in the 1st half and were 3-0 at the interval. However, we took our feet off the gas and paid the penalty. "Promotion by any means would be a fantastic achievement this season as the league is full of quality teams. But the championhsip trophy would be special. Away from the pressures of league business there is also the small matter of a Scottish Cup tie against SPL side Hibernian after last weekend’s win over Bo’ness United in the 3rd round. “It is really exciting to get Hibs in the cup and the lads are buzzing. I have not really enjoyed a decent cup run during my time at the club and we are really going to enjoy the occasion in front of a big crowd. There are a lot of Hibees and Jambos (including myself!) in the dressing room so the banter has been flying! Robbo is playing under his fourth manager at Central Park after Jimmy Nicholl resigned to to take up a coaching post with Kilmarnock in the summer. Nicholl’s assistant Colin Cameron - the former Hearts, Wolves and Scotland star - was promoted to the hot seat. “We knew all about the gaffer’s coaching style from the previous campaign so it was good to have some continuity and have a familiar face take over the reigns. I love his and Lee’s [Makel} football philosophy and it is class to play in this team." “It was surreal. I was sitting in the dressing room when the gaffer called me into his office. My first thought was what have I done wrong! He didn’t say anything at first and just threw the armband at me. I was doing cartwheels in my head but was stunned into silence! "It has been a great confidence booster to know how highly the gaffer rates me and a great honour to captain Cowdenbeath FC. There were other fantastic candidates such as Joe [Mbu], Toorie and Chopper [John Armstrong] so it was a pleasant surprise. As well as adapting to his new role as team skipper, Robbo has also had to make the transition from a full-time footballer to combining part-time football with working in a warehouse. “I have been full time with the club on a ‘modern apprenticeship’ sort of arrangement since 2007 but made the decision to go part-time in the summer. It was not sustainable to continue full-time on that kind of money now that I’m older so I needed to supplement my income with full-time work. I’m hating it and missing training on a daily basis! “I have always had a good work ethic and doing extra fitness work away from the club but it is my ambition to return to full-time football in the future. Lads like Darren McGregor, Morgaro Gomis, Danny Swanson and Craig Conway have shown the way in terms of making the step-up from the SFL. A team led by a 22-year old captain is very much packed with exciting young prospects with players such as Kenny Adamson (23), John Armstrong (24) considered as “old heads”. The average age of the team that recently defeated Albion Rovers was only 21. “We are a very young team and I feel a veteran at 22! We have so many talented youngsters in the squad which is a credit to the coaches at Cowdenbeath and the scouting set-up. Myself, Scotty, Tam O’Brien, John Ferguson, Dean Brett, Dene Drouge, Dan Mackay and Kyle Miller all came through the youth system while lads like Greg Stewart and Lewis Coult were picked up from the juveniles and juniors. “This club is a great place for any young player to learn their trade and the conveyor belt continues with lads such as Liam Callaghan who was recently down at Birmingham City on trial. Robertson can offer the younger players plenty of advice after making the transition from promising youngster to first team star player the hard way after suffering disappointment as a young teenager. He joined Hearts as a 12-year old from Tynecastle BC after a number of the boys in the team were scouted and asked to trial. It was a real blow for the then 16 year-old and he moved back to old team Tynecastle B.C. but was mysteriously unable to get into the team and quickly moved onto league leaders Loanhead B.C. Unfortunately, Loanhead soon folded with half the boys signing for Raith Rovers. The chance to move to Cowdenbeath came about thanks to his Granddad. A friend of a friend knew one of the coaches and arranged for a trial. “I trained with the under 19s around December 2006 under Jim Ward. I then played as a trialist in a number of games and Brian [Welsh - the manager at the time] came to watch me during one game at Rosyth and signed me afterwards. “We had a great team during my 2nd year with the 19s and it was really enjoyable. Jim was a great coach and also very dedicated. Scott Linton, Dene Droudge and Gary Cennerazzo - who all played for the 1st team - were part of the team. "We finished the season 5th or 6th and were unbeaten for a long spell which was a good achievement. We could have won the league but for the fact that so many players were promoted to the 1st team. I’m a great believer, however, that the sign of a good youth system is the number of players that graduate to the first team rather than the number of medals." 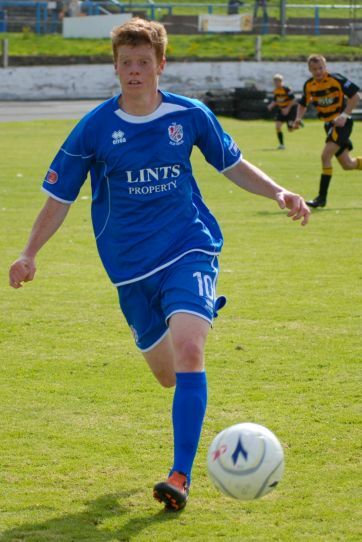 The young midfielder made his debut for the first team under Brian Welsh in January 2008 as a substitute in a 2-0 home win over Ayr United. However, the debutant was not quite as excited as might be expected! “Believe or not I was gutted to be named as a sub that day! Brian always named the squad a day or two before the game and each player was given a number. Generally speaking, if you were 1-11 you were starting. Well I was down as number 4 and I was absolutely buzzing. Brian didn’t say anything to me but must have changed his mind at the last minute which was a real let down. The player eventually made his starting debut against Queen’s Park in a crunch relegation game during a midweek game at Central Park. "Brian brought in Danny [Lennon] to play alongside me in central midfield. We started the game ok and were leading but Kettlewell equalised for Queen's Park straight from the kick off and they ended up beating us 4-2 despite only having 10-men for over half the game. "I ended up playing the last 6 or 7 games of the season and played well. However, it was difficult coming into a side that was struggling and the dressing room wasn’t a particularly pleasant place to be. There were a number of cliques and it was uncomfortable at times, particularly for the young boys." The season ultimately ended in disappointment with relegation confirmed following an insipid display against Arbroath in the play-off. The failure on the park also led to a change of management for the 3rd division campaign with Brian Welsh sacked and replaced by his assistant Danny Lennon. "I had high hopes for the new season but it was disappointing from a personal point of view as I did not progress in the way I had hoped. Danny came in and was under pressure to win promotion so it was difficult for the younger players to get a game. On top of that, I picked up a mystery virus early in the season which I took a while to recover from. I was flying during pre-season but suddenly found I was struggling and finding difficulty breathing during training/games. The disappointment was eased, though, when the club received ‘back door’ promotion to the 2nd division after Livingston’s demotion after going into administration. "Everyone one expected us to be the whipping boys after our late promotion but the team really came of age. Scotty, Dene [Droudge] and myself really stepped up to the plate and it was like 3 new signings for Danny. "The arrival of Toorie was a defining moment and he had a massive influence on me. Danny had the team set up with Toorie sitting in front of Joe and Chopper with three more advance midfielders. This allowed me the freedom to express myself. 2009/10 was also a personal success for the player after being selected in the 2nd Division team of the year but it was all change again that summer with Danny Lennon moving to St. Mirren. "Danny brought great success to the club over his 2 years in charge so it was no real surprise that he got the chance to step-up to the SPL. Jimmy Nicholl came in and I really enjoyed his training. He is a great coach and really focussed on the technical side of the game. "I did not return to fitness until the home game against Queen of the South in late August and I was in and out of the team for a spell. My confidence took a hit and I sat in the stand for six games after being dropped against Stirling Albion in November. Kyle Miller - who is a fantastic prospect - took my place that day and scored in a 5-1 win. "I was really disillusioned as I didn’t think that Jimmy had given me a fair crack of the whip. I was encouraged by many people to speak to Jimmy and eventually plucked up the courage. I had always been quite shy and this was really a defining moment for me. We had a good discussion in Jimmy’s office and standing up for myself was a maturing experience and has had a really positive impact on my character." Robbo was soon back in the team (albeit out of position at right midfield) but really took his opportunity after getting his chance in central midfield at Dens Park against Dundee. "The team were fantastic that day and we really should have won. I was really pleased with my performance and set up Scotty’s goal. "From then on in Jimmy seemed to settle on a formation and showed faith in the younger lads again. I played the remainder of the season alongside Mini [Mark Ramsay] and the boys were outstanding for the last 15 or so games of the season. We came so close to leapfrogging Ross County and staying in the 1st division against all the odds. The play-offs proved to be a let down for Cowden as Brechin gained revenge for the previous season (We also defeated Brechin in a winners takes all game in 2001 to win promotion to the 2nd Division). The side let a two goal lead slip in the first leg to draw 2-2 before losing 2-0 at home. "We let a good lead slip up at Glebe Park and I thought we were the better team at home but we lost a goal against the run of play and then another on the break as we pushed for an equaliser. "We seem to have become play-off specialists and becoming a normal part of our season! They are horrible games to play in with all the pressure involved despite giving me my best moment in football the year before. The cultured player would like to add more goals to his game after coming through the youth ranks as a free scoring midfielder. "High fitness and energy levels is a big part of my game but I would like to add more goals. I have five already this season (should have been six in my opinion but for a refereeing decision up at Brechin) and my target is to reach double figures for the first time at senior level. "My best goal so far, I think, was against Peterhead at home during the 2009/10 season. Jay Stein played a corner to me on the edge of the penalty box and I hit a sweet half volley into the top corner." The player has learned his trade under the tutelage of some top coaches but there is no doubt who the biggest influence on his career has been. "I have been privalged to learn from people some top managers and the youth coaches at Cowden and Hearts were first class. However, my dad has encouraged me all theh way and has followed me all around the country to watch me play. He played the game at junior level himself and always offers advice. I think he talks sense and is able to analyse the game from an unbiased point of view - others on the terracing may disagree!" 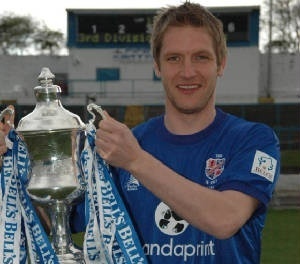 The popular player now hopes to taste 1st division football again next season and join legendary skipper Innes Ritchie in Cowden folklore by lifting the championship trophy in 2012. It is a sight that all Blue Brasilians are dreaming of.